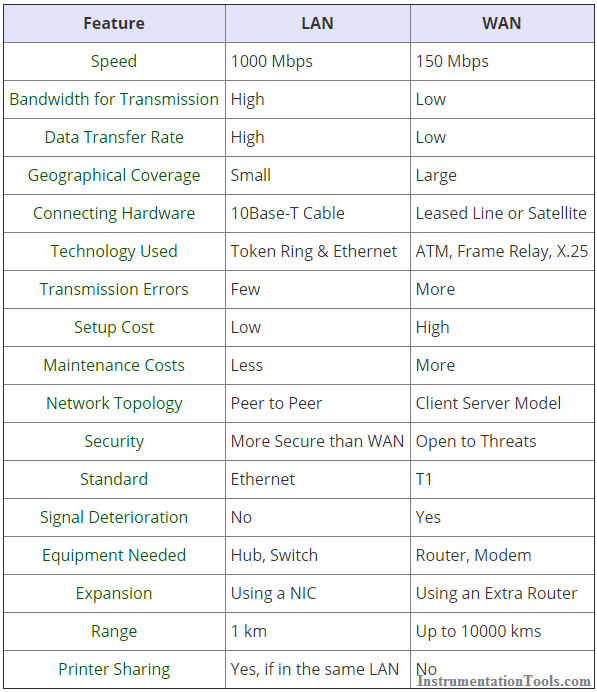 The two most popular network types today are LAN (Local Area Network) and WAN (Wide Area Network). These two networks are generally classified on the basis of their coverage area. Given below are few points that differentiate these two networks. Local area networks (LANs) allow computers and devices that are near each other — and usually making use of the same switch or router — to connect to share files and complete tasks. Consisting only of everyday devices (e.g., desktops, laptops, tablets, printers), router and/or switch, and Ethernet cables or wireless cards, LANs are relatively inexpensive to set up and are commonly used in homes. Ethernet cables, like the Cat5, Cat5e, and Cat6 and Cat6a, can be used to physically connect computers to the network. In the instances where fiber-to-the-home (or similar) is available, copper cabling may also be used at some point. Wi-Fi has become one of the most popular methods for wireless networking over a local network. A wide area network (WAN) is used to connect computers that are not close to one another. It is possible — and almost always the case — that LANs are connected to WANs. This enables small home or office networks to connect to wider networks, such as those across state or country lines. Most WANs connect through public networks, like the telephone system, or via leased lines. The Internet, which connects computers all around the world, can be considered the largest WAN in existence. What is LAN, WAN, MAN, SAN, CAN, PAN and GAN ? A computer network consists of two or more computers that are interconnected with each other and share resources such as printers, servers, and hardware and exchange the data in the form of files, facilitating electronic communication. Computers on a network can be connected through twisted pair cables, telephone lines, radio waves, satellites or optical fiber cables. The first computer network designed was the ‘Advanced Research Projects Agency Network (ARPANET)’ by the United States Department of Defense. Since then, myriads of new computer networking technologies have been designed. This tutorial only covers the first three network technologies i.e LAN, WLAN, WAN, MAN, SAN, CAN, PAN and GAN. 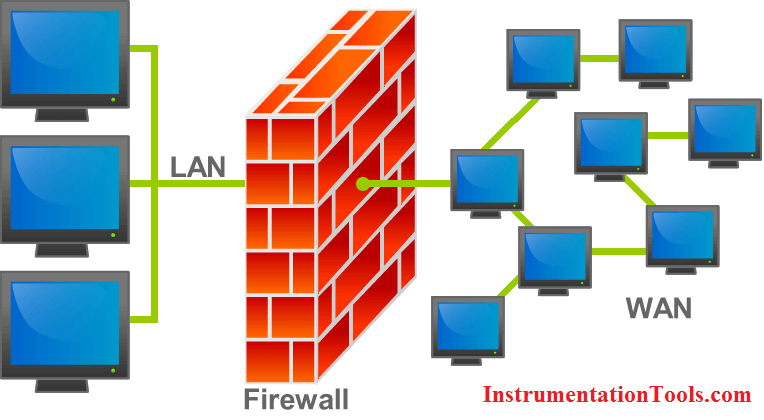 LAN: A local-area network (LAN) is a computer network that spans a relatively small area. Most often, a LAN is confined to a single room, building or group of buildings, however, one LAN can be connected to other LANs over any distance via telephone lines and radio waves. Local Area Networks cover a small physical area, like a home, office, or a small group of buildings, such as a school or airport. WAN: A computer network that spans a relatively large geographical area, generally having a radius of more than 1 km. . Typically, a WAN consists of two or more local-area networks (LANs). Computers connected to a wide-area network are often connected through public networks, such as the telephone system. They can also be connected through leased lines or satellites. MAN: A metropolitan area network (MAN) is a network that interconnects users with computer resources in a geographic area or region larger than that covered by even a large local area network (LAN) but smaller than the area covered by a wide area network (WAN). SAN: SAN (storage area network) is a high-speed network of storage devices that also connects those storage devices with servers. It provides block-level storage that can be accessed by the applications running on any networked servers. Storage Area Networks help attach remote computer storage devices, such as disk arrays, tape libraries, and optical jukeboxes, to servers in such a manner that that they appear to be locally attached to the operating system. CAN: A Controller Area Network (CAN bus) is a vehicle bus standard designed to allow microcontrollers and devices to communicate with each other in applications without a host computer. PAN: A personal area network (PAN) is a computer network used for data transmission amongst devices such as computers, telephones, tablets, personal digital assistants, fax machines and printers, that are located close to a single user. GAN: A global area network (GAN) is a network used for supporting mobile across an arbitrary number of wireless LANs, satellite coverage areas, etc. INTERNETWORK: Internetworking is the practice of connecting a computer network with other networks through the use of gateways that provide a common method of routing information packets between the networks. The resulting system of interconnected networks are called an internetwork, or simply an internet. Computer networks are an integral part of our lives. It is only because of networking that telephones, televisions, radios, and the Internet are at our fingertips. What is a Network ?